5/5/12 UPDATE: All 8 babies have gone home with their new families! Summary: This round is a repeat breeding — the first round of babies from these two pairs have awesome personalities, just like the parents! These 8 babies will be weaned and ready for new homes from mid-late April 2012. 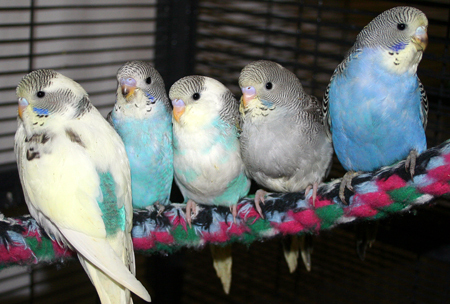 All of this round’s babies are English-American crosses and white-based in color: blues, violets, grays; some with yellow faces; some single and double factor dominant pieds. Scroll down to read recorded color and mutation information on each individual chick. If you’ll need a cage and bird supplies, see our bird supply page to see what we offer our adopters! NEW PHOTOS ADDED 4/18/12 — scroll down to see! Bookmark this page and check back for progress updates and new photos as they grow! 4/17: The oldest chicks cuddling after some free flight time in the bird room. Left to right: Tumbleweed, Bumblesweet, Kratt, Jimmy Z, Star Catcher. 4/17: “Donita”, the youngest of this round, finding her balance. Yellowfaced gray cinnamon double factor pied (that’s a mouthful!) female. 4/17: Just fed and still beggin’ for more. “Donita” (left): yellowface cinnamon gray double factor pied female. “Nubs” (right): white-faced gray female. 4/17: “Razzaroo” feelin’ fat and happy after breakfast. 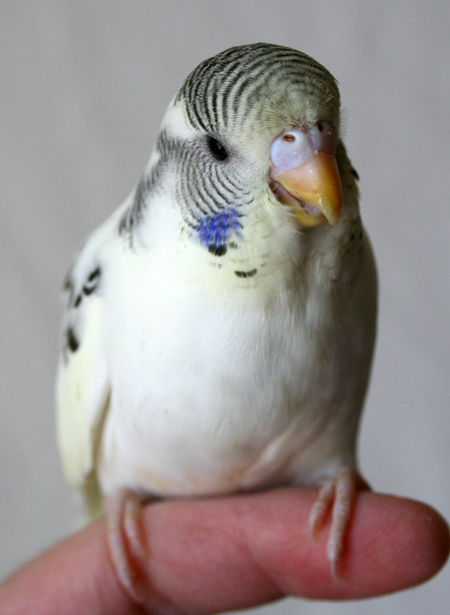 Violet dominant pied female. 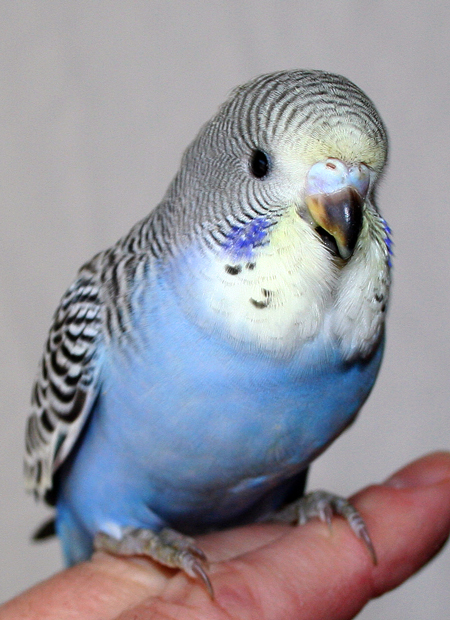 “Freud”: Yellowface sky blue dominant pied male English budgie. Possible: split cinn? 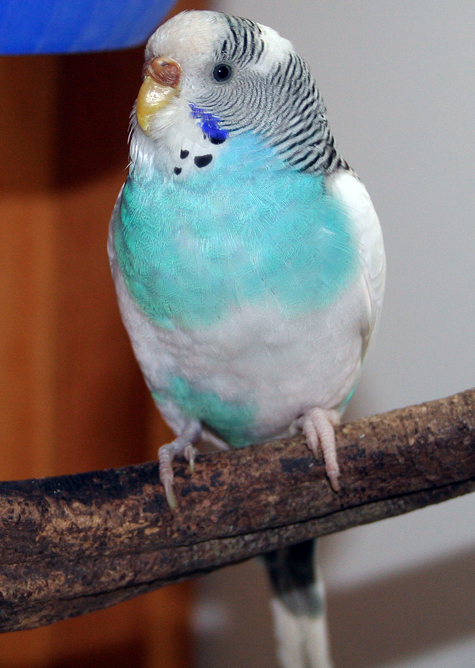 split opaline? 2T-08 11 by Terry Travis; brother to Sigmund. 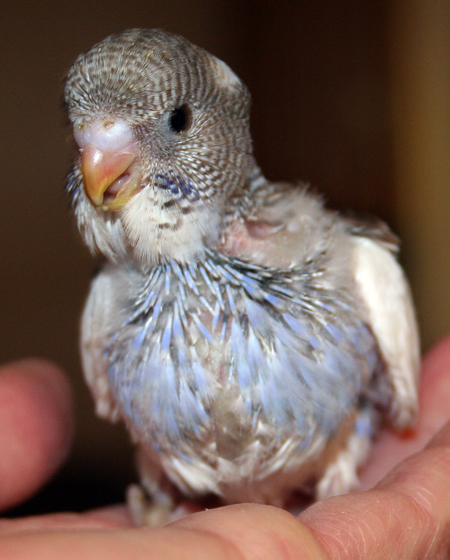 “Polly”: single-factor violet blue greywing female American parakeet. 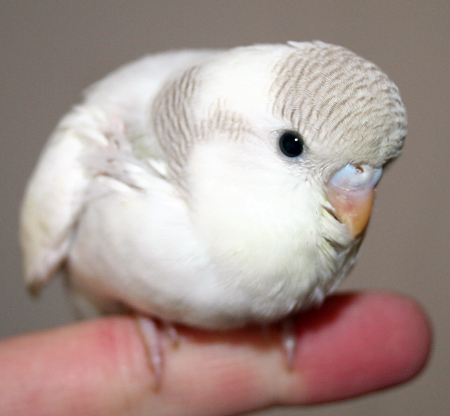 Possible: split recessive pied? Clearwing? Related to Hydrangea, Lilac, AquaMan. Mutations: yellowface, dominant pied, dark factor? Outcome: 6 eggs; 6 fertile; 5 hatched; 4 survived. First egg laid 2/12/12; last egg on 12/22/12. 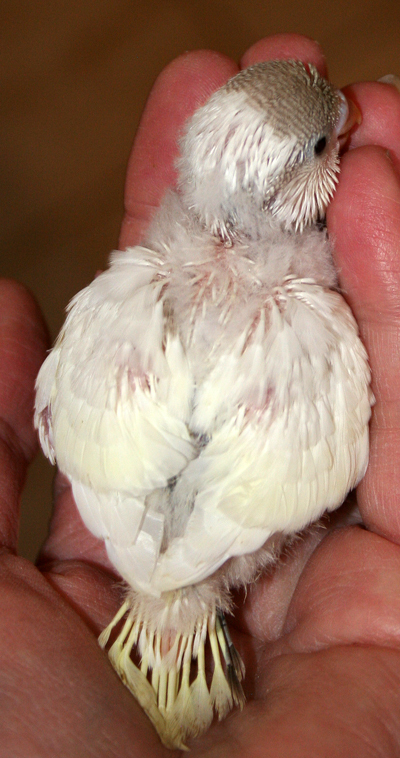 First chick hatched 3/1/12; last hatched 3/8/12. 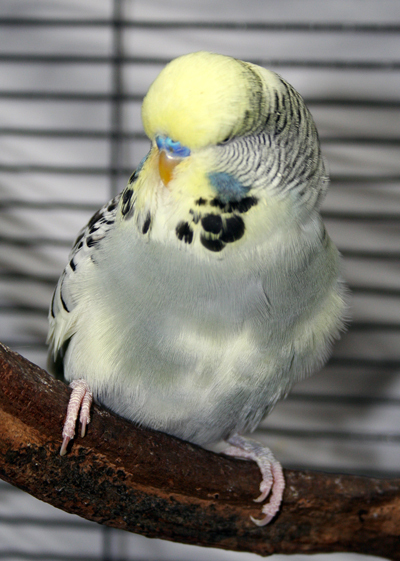 “Sigmund”: Yellowface gray dominant pied male English budgie. Split: Opaline, Cinnamon. 2T-07 11 by Terry Travis; brother to Freud. 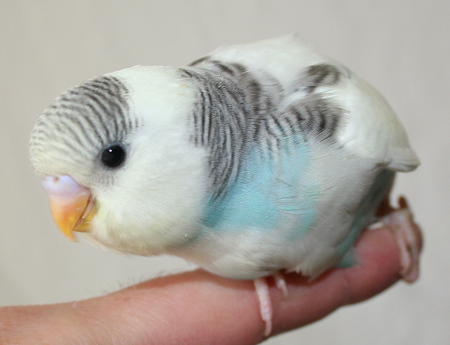 “Rain”: Skyblue dominant pied female American parakeet. Split for greywing. By Mellow Yellow x Mostly Cloudy. Outcome: 8 eggs; 7 fertile; 6 hatched, 4 survived. First egg laid 2/16; last egg on 3/1/12. First chick hatched 3/7/12; last hatched 3/17/12. Colorado Hand-fed Budgies and Parakeets! 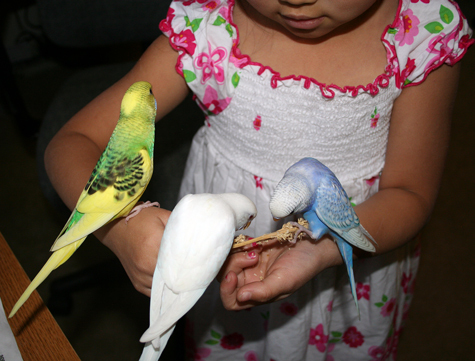 : Our family raises, hand-feeds, trains and adores budgies and parakeets. 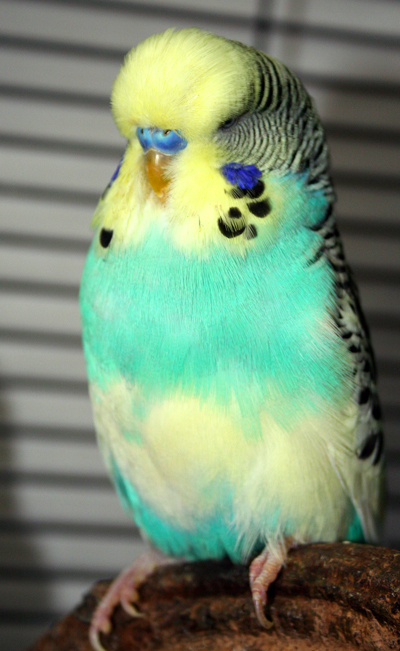 Learn more about our selective breeding program and view our gorgeous, tame birds. Pictures of Our Hand-fed Babies: Come ooh and aahh over all the cuteness and watch them grow up! 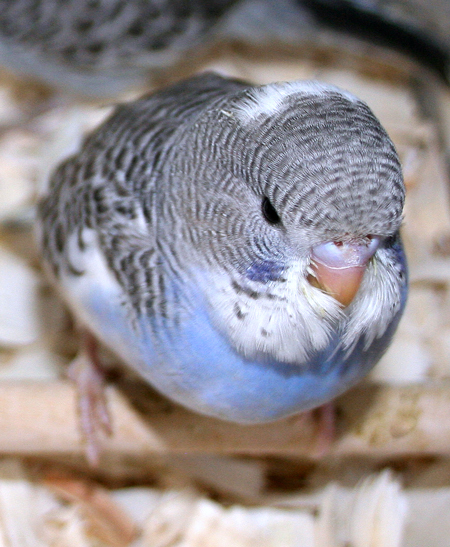 Pre-Adoption Questionnaire: If you are interested in adopting one (or more) of our budgies when they become available, please respond to these questions. 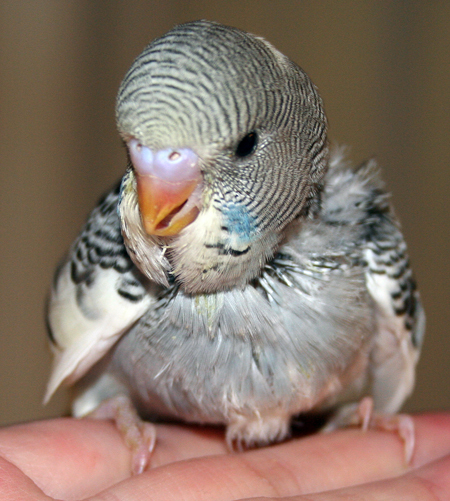 Bird Nutrition and Food Recommendations: Malnourishment is a leading cause of premature death in pet birds. We provide lists of healthy foods and tell you how to grow your own sprouts. Bird Playgyms, Stands and Perches for Sale: Learn how to make your own — or order a custom one from us. 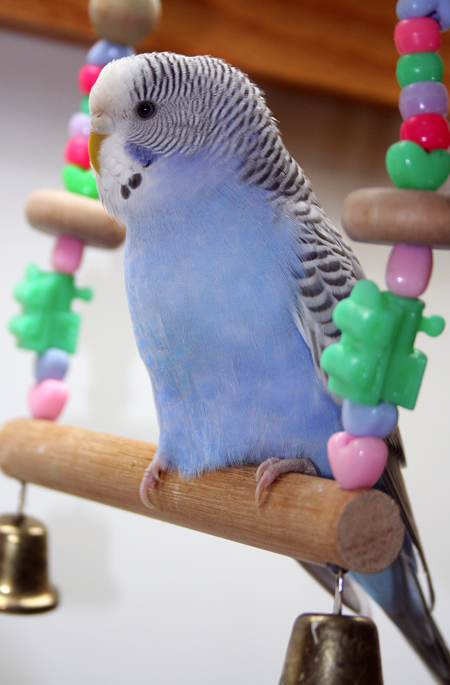 Budgie Parakeet Supplies For Sale: Organic food mixes, cages, toys, play gyms, perches, cuttlebones, more! 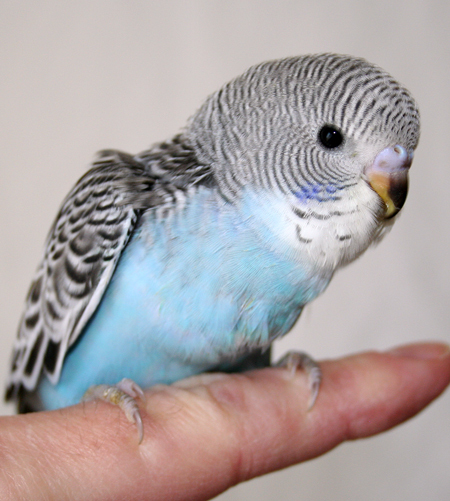 We offer these essential and favorite bird supplies as a courtesy and convenience to our budgie parakeet adopters. Pick up is at our home by appointment only. 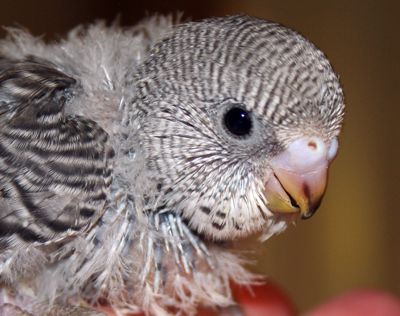 So sorry, but we keep a waiting list — those budgies have already been reserved. Please complete our pre-adoption questionnaire to be added to our waiting list. Thanks!